Financial Services: Too Complex For Consumers? For the last six months I’ve been focused on developing a thought leadership program for my new company, a payment processor. To be effective for content marketing, sales support and brand building, the thought leadership needs to be focused on meta-trends in the industry. So I’ve been drinking through the fire hose, trying to understand the financial services industry. What I’ve come to understand is … it’s complicated. There are many players enabling the transfer of money – most not directly interfacing with customers. In such a complex environment, good customer experiences aren’t always the priority. I’ve borrowed a graphic from my friend and colleague, Ben Love, who created an excellent online resource at uspaymenthandbook.com. 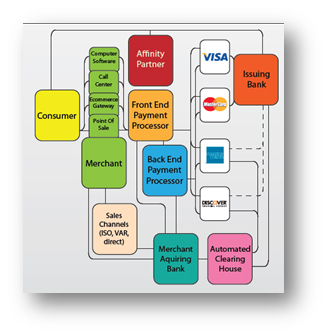 His diagram shows the players in a typical consumer transaction. When a consumer interactions with a merchant to make a purchase, a front-end processor handles the transaction authorizations and routes it from the point of sale through the appropriate card network. Visa and MasterCard are the largest networks, and form a bridge by which the cardholder’s bank (issuing bank) can make the payment to the merchant’s bank (acquiring bank). Along the repayment path, the transaction and authorization code become a settlement file that passes to a back-end processor. That entity applies a variety of fees for the participating players and initiates payment through an Automated Clearing House to distribute the funds. Simple, right? Not even close, and that’s as simple as I could make it. Every payment method has a different path, different players, and different fees for services rendered. Along the way, various value-added resellers and other providers may support the primary players with industry-specific software or services. Participants get a cut of the interchange fees paid by the acquiring bank to the issuing bank to compensate for transaction-related costs. But there are ways to get more than your standard cut, too. As Carol Coye Benson and Scott Loftesness say in their book, Payment Systems in the U.S, ” In recent years, providers have been increasingly aggressive in pricing exception transactions to end parties. In some cases, the revenue from an exception transaction far exceeds the cost of the transaction, and contributes significantly to the profitability of the product. This is the case, for example, with bounced check fees, card overlimit fess, and overdraft fees.” The debit-card fees many large banks have tried to implement lately would fall into this category as well. What does all this mean to the consumer? Not many of us understand what is going on behind the scenes. We swipe and hope. It’s when we have a complaint or problem that we begin to see the complexity. Who hasn’t been passed from system to system in search of resolution? The customer experience research I directed in 2010 (http://bit.ly/oDzXg8) showed that, just 63% of customers reported satisfaction with their most recent service experience with credit card issuers (the second lowest of all industries) and 20% reported dissatisfaction (the highest of all industries). But with so many institutions and B2B providers involved in so many millions of card swipes each day, it’s easy to see how customer experience can become a back-burner priority. One can only hope that even in such a highly-complex industry, perhaps the institutions who remember the importance of pleasing the payers will be the successful players. This entry was posted in Customer Experience, Financial Services and tagged Customer Experience, Financial Services. Bookmark the permalink.